Over the past few days we have come to hear a lot of things on the happenings in the Indian state of Kashmir. For the first time in the valley there has been a media shutdown. The government has come down with a gag on all the daily newspapers. In an overnight raid the police seized the printed copies and plates of several papers to prevent further circulation. The media houses have been asked to not print their daily papers till 19th of July. The internet and the telephone communication has remained shut since the beginning of the protests. All this began with the encounter of the Hizbul Mujahideen commander Burhan Wani on 8th of July in which he was killed by Indian security forces. Around 2 lakh people are said to have turned up for the funeral procession of Burhan Wani. In the aftermath of the procession the protests by the Kashmiri people started. The use of pellet guns by the police since 2010 to quell protests has been questioned by various human rights organisation. Peoples Democratic Party (PDP), which is the current ruling party and was the opposition in the previous regime have come to accept pellet guns as a necessary evil. They were the ones who were protesting against the previous government when they were using pellet guns. The Indian State- A military state? When the king of region acceded to Indian state the then Prime Minister of India said this “Kashmir’s accession to India was accepted by us at the request of the Maharaja’s government and the most numerously representative popular organization in the state which is predominantly Muslim. Even then it was accepted on condition that as soon as law and order had been restored, the people of Kashmir would decide the question of accession. It is open to them to accede to either Dominion then,” in one of his telegram. But since then the government of India has been a military occupier and has not attempted to find political solution to the problem at all. The ratio of civilians to the army personnel is put at around 15 to 20 to 1 in the region by various agencies. The current situation there stands as an example of this. Many experts have pointed out that Burhan Wani had not committed any serious offence that warranted his killing. The government time and again seems to have preferred a military solution than a political one. Many point out that talking him into surrendering or giving up arms as it did with the previous generation of militants would have been a better solution for India. But could we expect anything else from the current Indian state? A woman has been fasting unto death for about a decade and a half against the draconian law AFSPA but to no respite. Then there are the Maoist affected parts of central India. In the recent past the Indian security forces have been involved in many questionable encounters, terrorising the indigenous population and stifling the voice of civil society. One clearly sees Indian state acting as the militia of mining companies to clear out the indigenous population. The forces have hounded journalist Malini Subramanian and civil society like JLAG. In all this we see the Indian state working against its own people (or the people it claims as its own). While all this goes on across the country the mainstream population and the media are apathetical to the instances of oppression by the state. And the worst part about all this is that the so called liberals and the lefts are also take a completely nationalist-imperialist approach to the situation of Kashmir. The recent movement in Jawaharlal Nehru University in Delhi stands as a testimony to this. The movement that stood for Azaadi, was reluctant to move beyond ‘good nationalism’. Hidden beneath the catchy speeches of Kanhaiya Kumar was the reluctance to admit the occupation of India in Kashmir. Many were not ready to accept the inherent othering that nationalism always relies on. The nationalism of the Indian state has become a Hindu-Brahminical-Imperial one where the muslims in most situations have been othered. While acknowledging the first two especially in the era of BJP rule many people in the left refuse to acknowledge the imperial nature of the Indian state. And this is best exemplified if we look into the kind of environment in which the youth that is spearheading the protests against Indian forces were raised in. There has been a fall in militants entering from Pakistan. 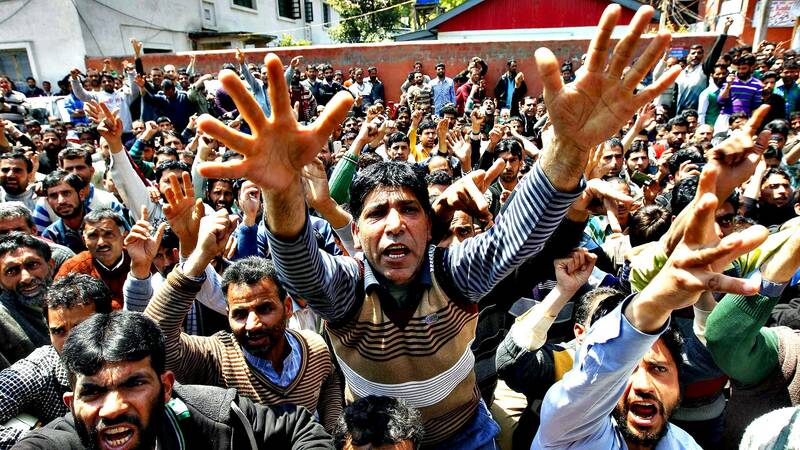 Even among the Kashmiri youth the main demand was Aazadi and Pakistan had been sidelined. After separatists like Yasin Malik had given up arms India should have gone in for a political solution. Rather a militaristic approach of the state paved way for a never ending problem. The voices that have come out from the valley, especially that of the youth point out to this. They have been frustrated by the occupying forces. Tortures and violence had become an everyday occurrence. And the Indian state bred a generation of men and women who had seen nothing but this. Stones of the protesters were intended as responses for the bullets from the Indian Army. And a boy from a simple educated family became the poster boy of Hizbul. What seemed to have motivated him and man other boys in the valley seems to be the guns of the Indian state rather than anything else. THe guns of the Indian state have drove them towards militancy. India is supposed to be the largest democracy of the world. But in many pockets within and outside the nation this democracy operates as a straitjacket. And the means of running such a democracy against the population that is claimed to be its own is coming from the military. This does not seem like a democracy to me.